The Scooby-Doo Project: The Almost Forgotten Scooby Special – AiPT! Man, in the late ’90s and early ’00s, Cartoon Network was doing some really fun s--t with the Scooby-Doo franchise. Let me set the scene for you: It’s 1999 and no one can shut the hell up about The Blair Witch Project, a found footage horror film that exceeded all human expectations thanks to a new thing called “viral marketing”. That movie came out in July, so by October everyone was ready to stop being scared of it and start making fun of it. In comes Cartoon Network with an interesting idea on how to get viewers to watch 30 year-old reruns of Scooby-Doo, Where Are You? in marathon format instead of, you know, trick ‘r treating or going to parties or doing literally ANYTHING else.So to dress up their 24-hour marathon, they themed the reruns around an ongoing storyline told through commercial bumpers. In these segments, Scooby and the gang basically reenact the plot of The Blair Witch Project, beat for beat, and all die horribly under mysterious circumstances. It was a hell of a Halloween for us all. Before I talk about the actual special, I want to mention how good Cartoon Network was in the ’90s at dressing up reruns to make them feel like “events”. The network back then was mostly scheduled with Hanna-Barbera catalogue titles to fill the day, and to keep the kids coming back for more, they made the decades-old material *feel* like something new. I talked about it a bit toward the bottom of my article on Wacky Races Forever, but Cartoon Network’s strategy was to show their old cartoons in weekend marathons with a gimmick tied to them. An example was “Toonapalooza”, a rock festival that was nothing but reruns of cartoons that had musical segments in them, but with interstitials that saw the characters in newly (crudely) animated segments doing silly s--t. Or, for a while during the Super Bowl, they’d show a Tom & Jerry marathon with play-by-play commentary segments between the cartoons as John Madden and Pat Summerall went over the highlights. And it WORKED. You could watch Scooby-Doo, Where Are You? every single weekday after or before school (they showed it that much). You may have even seen every episode a dozen times over (they showed it THAT much). But how often were you going to get the chance to see those same episodes surrounded by 10-second clips where Shaggy stands in a corner waiting to be murdered and Fred has a mental breakdown when he realizes they’re all going to die? So that’s what got us to The Scooby-Doo Project. However, I think of all their gimmick-themed rerun marathons, this was Cartoon Network’s most elaborate. The entire thing is filmed in live action with the Scooby characters overlaid on top of the footage. They’re still rendered in their ultra-flat Hanna-Barbera style, and they’re always sort of “floating” on the environments, but the effects amalgamate better than you might think. In the past, CN would just take old animation and overlay onto a newly drawn background then loop new dialogue and call it a day. It WORKED, but in a Space Ghost Coast to Coast sort of way; it was crude and cheap regardless of how effective it was. The Scooby-Doo Project felt like a legit PRODUCTION. The Scooby-Doo Project, either in spite of its parody nature or because of it, is actually a little spooky. 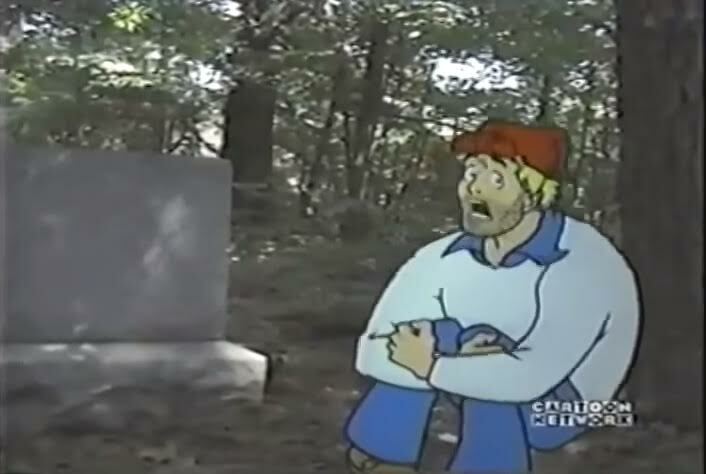 It follows the plot of The Blair Witch Project to the letter, so the whole thing opens up with police at a press briefing, explaining that Scooby and the gang went missing in the woods while filming a cemetery, and while they haven’t been found, tapes of their investigation were recovered. I mean, right off the freakin’ bat, you know that Scooby, Shaggy, Fred, Velma and Daphne didn’t make it out of those woods. And that’s a little unnerving. Every little detail is recreated, sometimes with a comedic twist (Shaggy eats the map) and sometimes, to eerily awkward effect, NO comedic twist at all. Yeah, sometimes they just play the horror straight and you’re left wondering if you’re supposed to be taking this seriously or not (probably not). I mean, the special ends EXACTLY the way the movie did. Velma finds Shaggy standing in the corner of the basement and she’s attacked from the behind. She drops the camera and everything goes black. Then there’s a “Missing” poster of the Scooby cast and that’s it. Roll credits. The bumper segments were eventually compiled into a 10-minute short film that Cartoon Network could rerun on special occasions, but it loses a lot in that format. Firstly, they created a TON of footage for this thing, probably a full half-hour’s worth, and so whittling it down to 10 minutes leaves a lot of the best scenes behind. That includes a second ending, after the “Shaggy in the corner” bit, where they unmask the monster (a generic zombie and not the trademark-infringing Blair Witch). It turns out to be just some guy, only for the gang to be attacked by the REAL monster and then drop their camera and we’re back where we started (with them all presumed dead). But more than that, the bumper segments would mix it up between the video footage of Scooby and the gang running around the woods and footage of the police investigating the case. It’s something that actually makes The Scooby-Doo Project a little creepier than The Blair Witch Project if you can believe that s--t. At the same time as we’re watching Fred and Daphne and all them doing shtick in a graveyard, the footage is intercut with the police putting tape around the Mystery Machine and search parties trying to find their corpses. It’s an ever-present reminder that “they didn’t make it”. So yeah, the whole special is pretty dark, all things considered. I know using Scooby-Doo to spoof an R-rated movie might seem extremely strange now (though the recent Mystery Incorporated series had a f-----g Saw parody episode; I’m not kidding), but it goes back to something I mentioned in my review for The Flintstones: On the Rocks. In the late ’90s, Cartoon Network had no idea what to do with its old Hanna-Barbera IPs that were only popular with the adults, so they were more than happy to use them in experimental material aimed at grown-ups (it’s how we got that original Adult Swim lineup). The Scooby-Doo Project was a product of that era, the same era that gave us all that really cool Scooby s--t I opened this article up mentioning. Unfortunately, What’s New Scooby-Doo? would eventually come around in 2002 and the brand would revert back to formula for a decade. The cast for the special is that late ’90s, early ’00s group that only served for about five years. I talked about Scott Innes as Shaggy in my Night of the Living Doo review, but I’ll summarize with: I never cared for him. His Scooby was alright, though; I’ll give him that. Meanwhile, Frank Welker plays Fred because he’s been playing Fred since 1969 and he isn’t about to stop now. B.J. Ward plays Velma and, you know, I always liked her in the role. The character seemed to change after Natalie from Facts of Life took over; hearing Ward reminded me that there was a time when Velma wasn’t an impatient, passive-aggressive shrew. Ward’s Velma was maybe a bit too mousey, but she could still get catty with Daphne from time to time. Mary Kay Bergman voices Daphne for one of the last times in her career. She died a month after this special aired in one of the sadder stories you’re going to go read on Wikipedia today. I liked her Daphne, but the truth is that she didn’t have the role for very long; she mostly just fills a brief gap between the lengthy runs of Heather North and Grey Delisle (now Grey Griffin). It’s an unfortunately indistinct footnote transitioning from the classic performance of North and the modern, highly exuberant take developed by Delisle. So anyway, that’s The Scooby-Doo Project. I think it represents the best of what ’90s Cartoon Network could do: Their uncanny ability to repackage ancient reruns of mediocre television with cheap new bumper material that skirted the line between both kid and adult demographics. You can watch the short film version here and the stuff they left out here, but no promises that those links will be working five years from now.